Increases in environmental awareness, and decreases in budget sizes, mean that more and more offices are going paperless. But how can this be done? I've searched the web and surveyed colleagues to bring you some ideas of how to make your classroom (and maybe all of your academic pursuits) paperless. Make handouts available online only. Making lecture notes and handouts available online gives students the choice to print them out or only keep electronic versions, and saves you money by reducing the printing you are doing. If you are asking students to complete a worksheet in class, have it posted on your PowerPoint slides and ask them to copy it to their notebooks. You may also consider encouraging students to bring their laptops to class with them. Stop using overhead slides! Overhead slides need to be reprinted every time you update your lessons. (If you've been using the same slides for more than a few years, you should rethink your lessons. Aren't you getting bored with them?) Opt instead for a more renewable resource, like PowerPoint or the whiteboard/blackboard available in most classrooms. Have assignments submitted online. Use Blackboard Vista or other course management system to have students turn in their assignments online. Additional perks: everything is time and date stamped, and already in a form that can be run through plagiarism software if you so choose. Just make sure that you are providing comments online, and not printing everything out to write longhand. Perk for students: no more illegible handwriting to try to decipher, and grades are available as soon as you're done grading. Consider having quizzes/exams online. As long as you are comfortable with students completing work on their own, you can have them take their exams outside of class time. Many classroom management software packages (including Blackboard Vista) allow you to create self-grading multiple-choice, True/False, and fill-in-the-blank tests. You can also create rubrics for easy grading of open-ended written answer questions. Consider creating exams that are meant to be open-book, or use the timing features of your course management system to limit how long students have to complete the quiz. Even if you have students completing calculations where they need to show their work, you can do it all online (just introduce them to the equation editors available in most word processing software)! Use student response systems. For quizzes, exams, surveys - anything that requires numerical or short text answers in class. The U is now using TurningPoint. Find out more here. Adopt an e-book. I haven't made the switch yet, but it's something I'm definitely considering. Students like the cheaper prices, and you'll probably like the resource materials to which you gain access. Although many are worried about the quality of these texts, the ones you purchase through the major textbook publishing companies are usually just electronic versions of what you'd be using anyway. One thing to be aware of (and warn students about) is that many electronic textbooks only offer a limited subscription (and of course, students won't be able to sell back a used copy). Print, but only to your computer. If you or your students find an article online that you want to read, instead of printing to paper, print it to pdf. CutePDF is a free downloadable program to do this. (Tip from Small Notebook for a Simple Home.) When you do have to print, be sure to print in the smallest font you can read comfortably, with narrow margins, and on both sides of the page. Don't feel like you have to make all of these changes at once. Adopting small changes gradually will likely ease the transition and make you more likely to stick with it. Every little bit helps! There are additional tips for making your research paperless available on the Sciencewomen blog. 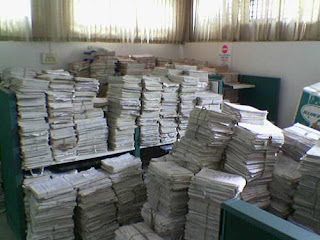 Try also TeachPaperless, a blog geared towards K-12 but also with useful insights for Higher Ed.